The number of accidents and fatalities in Kohlapur have reduced by double-digit percentage points in the first month itself. Ank Aha worked in partnership with the Kolhapur Police to reduce the number of accidents and fatalities on NH-4 stretch, passing through Kolhapur district. The team leveraged data analytics and technology tools to identify patterns and trends in accidents so as to prepare comprehensive mitigation strategy. A patrolling schedule and patrolling route were designed, based on the accident hotspots identified using insights from the data collected. In the year 2015, Maharashtra had witnessed the second highest proportion of road accidents. In addition it had the third highest percentage of people killed during accidents. The NH4, which accounts for one percent of the total national highways network in the country alone accounted for approximately four percent of the accident prone areas/hotspots. The first stage involved digitizing all information available with the police, including data on injuries and fatalities, and information about the location and timing of accidents, and the type of vehicles involved. 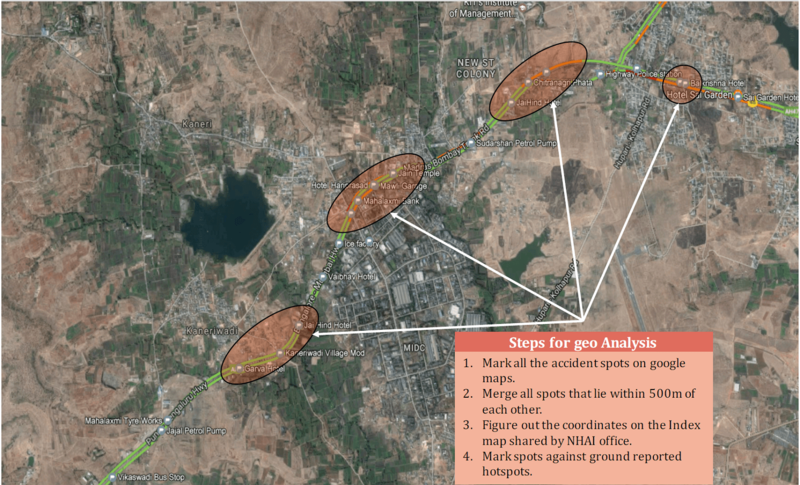 Spatial analytics tools were then used to map and analyze public locations against the details of past accidents on the NH4. Using this, we made predictions, to identify the most common accident spots. We then used these data insights to create a patrolling schedule to be followed by the constables. For example, a majority (78%) of the accidents occurred between 10:30 AM – 8:30 PM, with 45% of them between 2:30 – 5:30 PM, so police personnel were deployed accordingly. We also traced the path that a patrol vehicle should take in order to be at a hotspot when it sees the maximum number of accidents. The number of accidents and fatalities have both reduced by double-digit percentage points in the first month itself. In particular, as a result of targeted patrolling, highway accidents have reduced by 40% in 4 months.